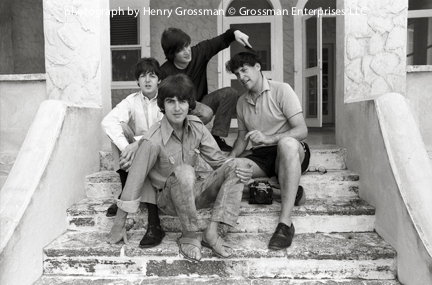 Henry Grossman shot the Beatles extensively between 1963 and 1967. Henry, only a few years older than the Beatles themselves, developed an immediate rapport with the group. 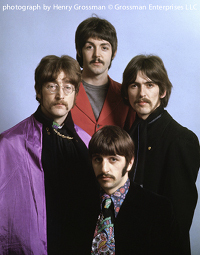 In addition to covering their initial appearance on the Ed Sullivan Show and the movie locations of "Help! ", Henry enjoyed unprecedented access and was invited into their homes to shoot them informally with their friends and families. 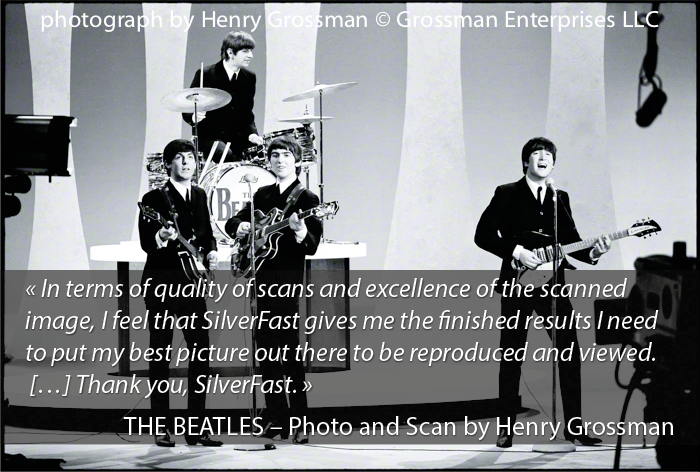 Many years later, Henry discovered SilverFast scanner software for creating brilliant scans from his precious photographies. With this digital high-quality SilverFast archive, his masterpieces are safe from loss and decay. Some of them are now available as fine art prints on prints.henrygrossman.com. 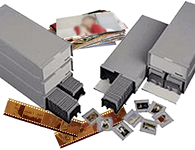 Many consumers consider the scanner resolution to be the most important characteristic when it comes to image quality. In addition, there is a big difference between physical and optical resolution, often mixed up, but explained below. However, the most significant indicator for a scanner's quality is its Dynamic Range, which we cover first. Multi-Exposure is one of the most popular SilverFast features and among the most important inventions in digital imaging. It records an original's maximum Dynamic Range by performing a double scan with an increased exposure time of the second scan. This procedure captures the light image area details in the first pass and the shadow details in the second. Afterwards an algorithm calculates the final scan, which now contains more detail, from each single scan. Basically, each single transmissive scan should be performed with Multi-Exposure! 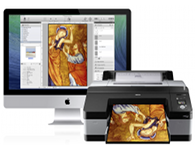 Many users always scan using the highest resolution, the scanner will allow. This way, they hope to get the best scans possible. But this is often not the case. Interpolation does not obtain any additional image information, as the magnification is based solely on a mathematical computation of existing image data and creates pixels where there were none before. The physical resolution, which manufacturers often print on the box very prominently, is theoretically achievable but again, only through interpolation. In practice, the resolution which is actually usable for the scan, called optical resolution, does not reach this theoretic value. There are a number of reasons, e.g. the complex optics (mirrors and lenses) are limited and may cause unsharpness at the edges of the scan area. To achieve the best possible scan resolution, we have adjusted SilverFast and revised the functionality of the resolution slider located down in the Scan dimensions dialog. 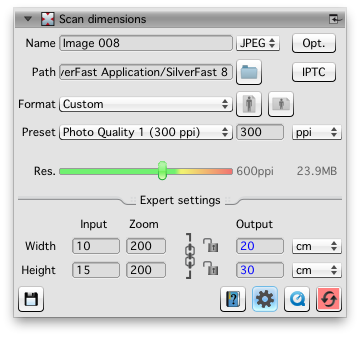 Use the Preset drop-down menu to choose a fixed resolution for the scan output file, e.g. 300ppi for printing or 72ppi for displaying on a screen. Use the slider control to set the resolution at which the scanner actually scans. The slider's color indicates if the chosen resolution is appropriate. In the red area, the resolution is interpolated, the scanner is not able to reach this resolution physically. The scanner easily achieves resolutions marked green, physically as well as optically. In between, from yellow toward red, although the scanner is physically designed for these resolutions, it does not always achieve them optically. Use our Resolution-Target USAF 1951 (see below) to easily determine the highest resolution your scanner is actually able to achieve. Select your desired output format and output resolution at the Format and Preset drop-down menus. With your mouse, drag the red scan frame to the required size. Look at the Resolution Slider to check, whether the scanner resolution required for your settings is ok. In the green range, the scanner resolution is sufficient in any case. In the orange-red range you are outside optical resolution which would not secure the best possible image quality. Select Custom as Format and your desired output resolution from the Preset drop-down menu. With your mouse, drag the red scan frame around the image to the required size. Using the Resolution Slider you can now specify the scanner resolution. 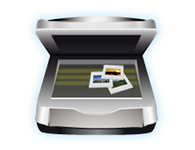 Depending on the scanner resolution, the output size of the scan will change. Next month: With our coming workshop newsletter we will have a closer look on the SilverFast Preview Concept. Welcome to our workshop newsletters! At this point during the upcoming months, we will regularly present practical scan tips and introduce special SilverFast features and their application in more detail. 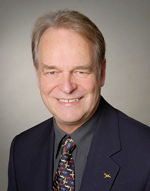 Physicist and visionary Karl-Heinz Zahorsky founded LaserSoft Imaging in 1986. Mr. Zahorsky, who was involved in the early initiation of desktop imaging and Color Management, is Chief Executive Officer of LaserSoft Imaging. In 1988 Apple invited LaserSoft Imaging to German CeBIT fair to showcase the first professional color scanner for the Mac. The SilverFast Resolution Target offers a simple way to determine the maximum resolution of different scanner models! Obtain scans with the best possible crispness and sharpness. Of secondary importance, the target also helps find the optimum sharpness settings for a chosen resolution. The target can also be used to find the best compromise between high resolution and sharpness and to also determine which areas of the flatbed scanner produce the sharpest quality. The SilverFast Resolution Target is equally well suited for flatbed or film scanners. SilverFast 8 scanner and HDR software runs natively on Intel Mac OS X systems from version 10.5 (including 10.10 Yosemite). 32bit computers will be supported as well as 64bit systems.